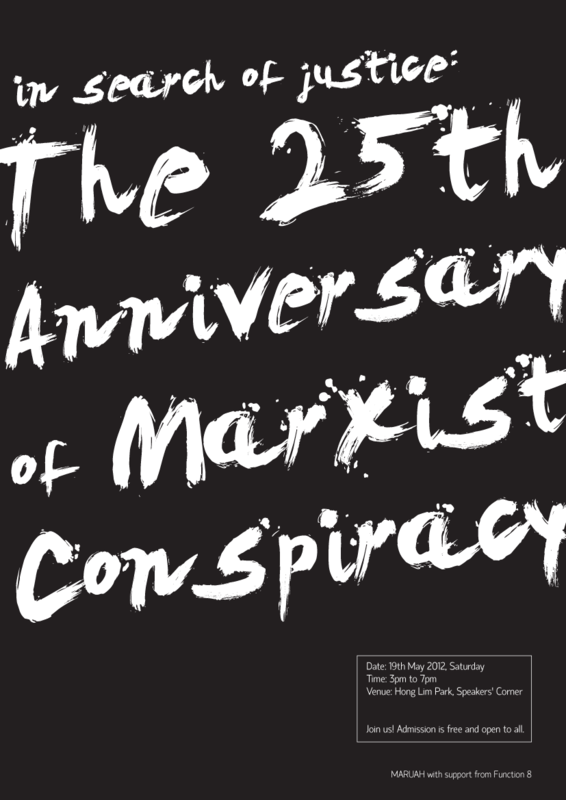 On 19th May 2012, MARUAH will join several other organisations in commemorating the 25th anniversary of the arrest of 24 persons during Operation Spectrum under the Internal Security Act (ISA), for an alleged Marxist conspiracy. So join us at Speakers’ Corner this Saturday [19th May 2012, 4pm] to commemorate the 25th anniversary of the ISA arrests under the alleged Marxist conspiracy. There will be an exhibition, booths, and sharing sessions by ex-detainees and civil society representatives. More details at the event website. This entry was posted on Tuesday, May 15th, 2012 at 7:28 pm and is filed under ISA, Position statements (Maruah). You can follow any responses to this entry through the RSS 2.0 feed. You can leave a response, or trackback from your own site.